If Americans needed any more evidence that we're witnessing a 'manufactured event' in Florida that is being used by satanic globalists in an attempt to complete their long-worked-towards 'destruction of America', including the takedown of our Constitution and specifically the 1st and 2nd Amendments, we get it in numerous new stories from all across the internet as detailed within this ANP story. With what appears to us to be 'a partnership made in hell' between corrupt and treasonous factions of the 'deep state', Broward County law enforcement and 'radical Islamic terrorists' doing what they each do best (lying to the American people), we must remember that the Islamic principle of taqiyya ALLOWS Muslims to lie to either 'smooth over differences' or 'gain the upper hand on their enemies'. And when we remember that Barack Obama 'switched sides in the war upon terrorism' and 'embraced our Muslim enemies', it all begins to make a bit more sense. Especially considering the fact that 'the deep state' has long permitted themselves to do things that the average American citizen would be locked away forever for, such as committing acts of terrorism upon US soil, and against US citizens, with the govt blaming such 'real or perceived attacks' upon other entities. With Americans quite literally now facing 'freedoms last stand' as 'enemies of America within' the Democratic party prepare to try to take down the 1st and 2nd Amendments, as Steve Quayle tells us, "at this point, we have to go on total 'Normandie invasion' against CNN and the 'gun grabbers crew' and 'Helly-wood hypocrites' and 'genocidal maniacs'. Our days are limited and our lives if we don't resist with all we have". With many recent stories below detailing the reason for Quayle's warning, and no surprises that the globalists are targeting both the 1st and 2nd Amendments at the same time, let's first take a quick flashback to the JFK assassination documents that President Trump allowed to be released in 2017 after decades of being censored via this October 2017 story from Zero Hedge. 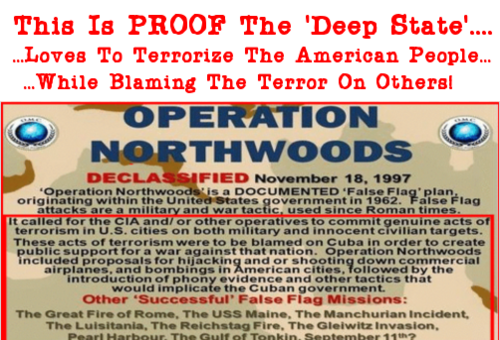 During Operation Mongoose in 1960, the CIA also considered staging "false flag" terror events in Miami and blaming it on pro-Castro Cubans. Knowing that these devils planned this kind of stuff over 50 years ago, and in Florida, is there any reason to believe that they wouldn't resort to such terrorism upon the American people again to help them accomplish their satanic agenda? We look at story after story below which helps prove we're witnessing such a diabolical and satanic plan now in action. If what we've really been witnessing over the past decade+ has been an attempt to take down America, then its not surprising that the globalists would need to get all parties on board and what we're seeing now from Broward County Law Enforcement offers us indications that they have long been happily on board with satan. As Gateway Pundit recently reported, one Nezar Hamze is not only a deputy sheriff in Broward County, he is also the CEO and Regional Operations Director for the Florida chapter of CAIR, the Council on Islamic Relations. As the GP story reported, back in 2015, Hamze bragged that Broward County sheriff Scott Israel had immediately began investigating people who were 'targeting' the Muslim community. While no truly peaceful community should ever be 'targeted' here in a free America, Barack Obama put a target on the backs of peaceful anti-war activists, US Patriots, Christians, Conservatives, 2nd Amendment enthusiasts, supporters of the US Constitution and preppers during his 8 years of running rampage all over the US Constitution. So, why was Israel so 'hands off' of potential Islamic terrorists in Broward county? 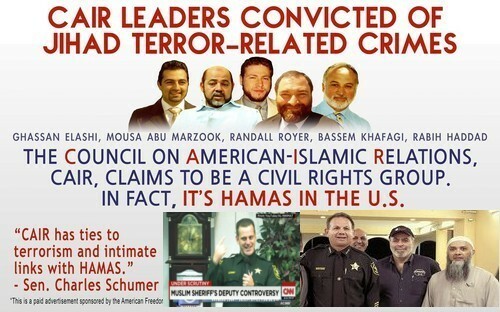 Also taking a hands off approach to crimes committed by children in the Broward county system, as Rebel Media recently asked, "why is Broward County Sheriff Scott Israel giving cover to a deputy who is part of CAIR leadership when CAIR has well-documented links to Hamas?" While we now know that there were at least 45 sheriff visits to the home of Florida killer Nikolas Cruz, as we hear in the 2nd video below from Rebel Media, Scott Israel's disgraceful leadership is an embarrasment to law enforcement here in America. Yet, how many more 'Scott Israels' are floating around in America, devils in high places having sold their souls to Islam and prepared to do the wrong thing when American's children are being slaughtered in their game of politics? 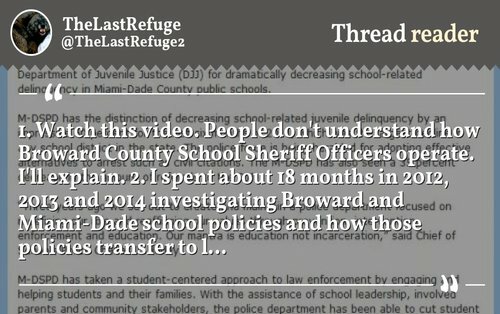 As we read from Infowars via the Conservative Treehouse, the corruption runs deep in Broward County with bombshell revelations revealing that there was a monetary motive behind Sheriff Israel allowing juvenile deliquents to run free in their school system. And what was his motive behind allowing Islamic terrorists free reign in Broward County? From Infowars. Infowars was the first major outlet to put a magnifying glass over bombshell revelations presented by a journalist at The Conservative Treehouse (TCH), which uncovered possible connections between policies implemented in 2012-2013 by Broward County officials to the massacre in Parkland, Fla. on Valentine’s Day. With news that the Marjory Stoneman Douglas High School will soon be torn down echoing the destruction of evidence that also took place at Sandy Hook elementary school after 'the event' there we have to ask, how many leaders of states like Connecticut and Florida have sold away their souls to the globalists, allowing their children to be 'sacrificed' to push the globalists disarmament agenda for America? 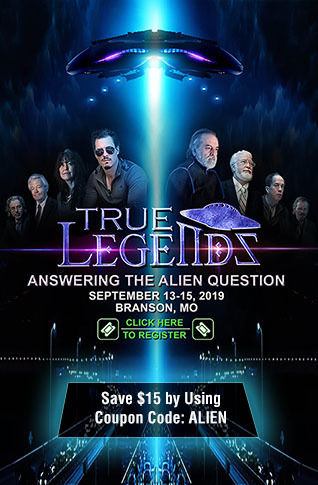 We remind you here of comments made by former Connecticut governor Dan Malloy who during an interview after the 'Sandy Hook event' stated "We were warned that something like this might happen". Later, after being approached by an independent media reporter, he denied ever making such remarks as heard in the 3rd video below. So Malloy, who warned you that "something like this might happen" as they were preparing to slaughter Americans children to complete their satanic agenda? The pure disdain these filth have for average, every-day Americans is absolutely disgusting. As Reason recently reported, when Sheriff Israel was accused of corruption, he responded "Lions don't care about the opinions of sheep", a comment that sounds incredibly familiar and quite similar to Hillary Clinton uttering "What difference does it make?" in response to her role in the deaths of Americans in Benghazi. While the legion of Hillary fans will continue to scream that President Trump is corrupt and wouldn't be president without the assistance of Russia and their 'bots', remember that it was Hillary who stole the Democratic nomination from Bernie Sanders, and that according to Donna Brazile herself, not some 'conspiracy theorist' but the then head of the DNC. Are these 'false flag events' to complete the takedown of America being orchestrated directly out of the office of Hillary Clinton? With a body count of over 120 names following her around where ever she goes along with committing outright treason against America and attempting to steal the election, it's easy to see that Hillary and the 'deep state' will stop at nothing to accomplish their satanic goals. 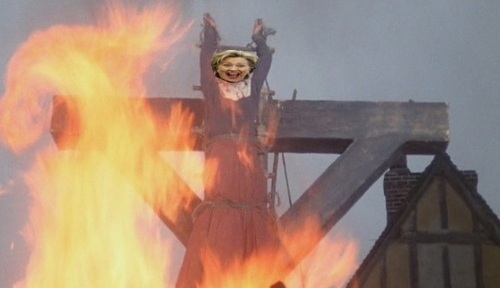 Living in a different era, 'criminal politicians' like Hillary were hung or burnt at the stake. While back on February 17th, we reported on ANP about a 1991 book by Bill Cooper titled "Behold A Pale Horse" which warned way back then that the 'secret government' would use mind-controlled 'patsies' to carry out school shootings here in America in an attempt to disarm the American people, why has the FBI done nothing to interrupt such events? As Judge Andrew Napolitano reported back in 2013, we have absolute proof that "the FBI had instigated, supplied, and controlled 17 of 20 terror plots over the last decade or so, and then took credit for preventing an attack". How many more such 'plots' do we not know about? And was what recently happened in Broward County and Las Vegas such plots? And why has the FBI refused to notify Americans who were on an 'ISIS target list' of American citizens? With the Obama administration proving to us that Christians, gun owners, Conservatives, US Military Veterans and other 'awakened' American patriots were on the top tier of their targets and now very real moves being made within various political circles to attempt to disarm Americans, we have to wonder where all of the guns and ammunition allegedly procured by the Obama administration has gone and if it is being prepared to be used against the American people? Is it time for the Trump administration to do an audit of all that weaponry which, like 'Fast and Furious, saw guns falling into the hands of people who didn't have the best intentions of Americans in mind? Who benefited from those multi-billion dollar purchases? 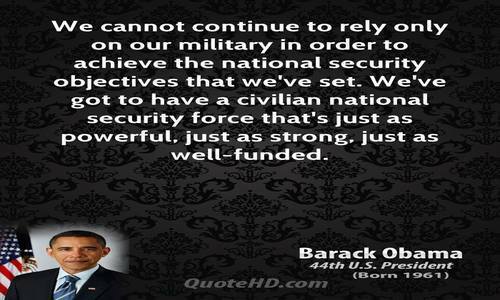 And remember that Barack Obama once stated that he wanted to have a civilian army equal in strength to the US military. Are he and the globalists preparing to use his trojan horse army against us? It's quite obvious that if Islamists want to overthrow America, they'll have to disarm the American people. So why have there been so many still completely unexplained anomalies surrounding the recent 'event' in Florida? With reports that the Florida school's security cameras were rewound 20 minutes, causing a lag in capturing the gunman inside the school, to reports that alleged shooter Cruz was wearing 'full metal garb' with one teacher's story demolishing the 'official' narrative to the shooter using smoke grenades and setting off fire alarms (the work of pro's, or did he get that from 'the voices in his head'?) to reports that Broward County sheriff's deputies were told NOT TO ENTER the school unless they had body cameras on (and conveniently, they were not equipped with body cameras), the 'official story' coming from the MSM and numerous 'talking heads' stinks to absolute high heaven. As we hear in the first video below from 'Truther Talk', we shouldn't be feeling guilty about calling the 'Florida event' a false flag because so many of them are. As she also tells us, "THIS VIDEO WAS REMOVED FROM YOUTUBE. THAT MEANS SHARE IT LIKE CRAZY!!" As Susan Duclos is reporting today, ANP will begin using 'D-Tube' when possible as an alternative to totalitarian 'youtube'. As Steve Quayle warns us, the bottom line of all of this, the attack upon both the independent media and the 2nd Amendment that we've been witnessing since the Florida event, is that we have to "resist this attempted gun grabbing genocide while we still have the breath to do so." Peacefully, of course, until even that is no longer possible. Yet as Thomas Jefferson once warned, "The beauty of the Second Amendment is that it will not be needed until they try to take it."